Quiet and discrete, Nexura offers the best in heating and cooling, in comfort and design. When in heating mode, its unique aluminium front panel has the capability of warming up and radiating additional heat, just like a traditional radiator. This exclusive feature can be activated by pushing the ‘radiant’ button on the easy-to-use remote control. Total comfort Thanks to the unit’s reduced air flow, the warm or cool air simply envelopes you, creating a feeling of relaxation and comfort. 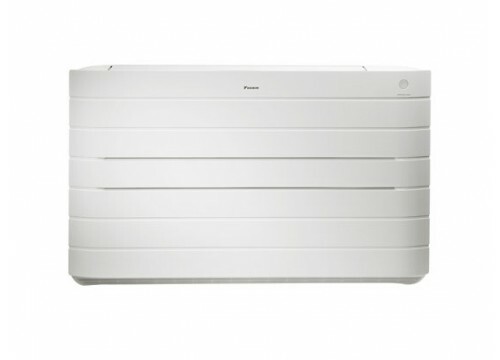 The built-in air purification filter ensures a pure and healthy indoor climate. Moreover, the air is distributed at the sound of a whisper. The noise produced amounts to barely 22dBA in cooling and 19dBA in radiant heat mode. Eco-friendly technology Nexura uses a renewable energy source: air. This makes it more energy efficient than fossil fuel based heating. By reducing CO2 emissions, Daikin heat pumps contribute to preserving our environment. Inverter technology also varies the heat pump’s compressor speed (the engine of the unit) to use only the amount of energy needed to heat or cool a room. Flexible control The indoor unit is easy to control with the infrared remote control supplied as standard. It comes equipped with a weekly timer allowing you to programme a seven-day schedule with four different actions per day. Fits any interior Whether built-in, wall-mounted or standing, Nexura is discreet and fits into any type of interior. Nexura can be used in a single-room set-up, with one indoor unit connected to one outdoor unit, or in a multiple room application with a maximum of nine indoor units connected to one outdoor unit. Radiant panel – Nexura possesses a unique feature: a front panel that heats up like a conventional radiator and softly releases additional warm air into the room for extra comfort. Weekly timer – Allows programming of the unit on a weekly basis, with the ability to schedule different settings for each day of the week. Powerful operation – Activates the maximum air volume for 20 minutes. After this, the air conditioner automatically returns to its original setting.